I recently took a trip to the US to visit family for Thanksgiving. And since David is now teaching English in Madrid with less time off, I decided to make a solo trip to New York City following my visits to Boston and Newport. 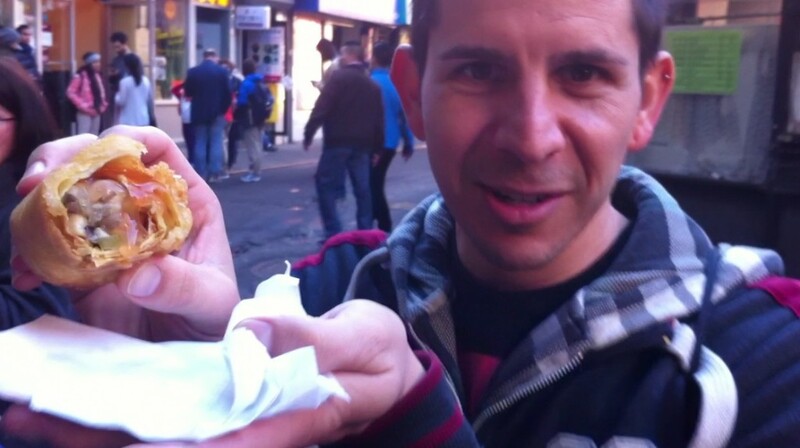 The highlight of my NYC visit was going on a food tour in Little Italy and Chinatown. New York City has countless activities to choose from but NYC tours focused around food, and specifically eating, are sure to please. And at just $49 for a 3 hour, face-stuffing good time, it’s a bargain and well worth the price. I stayed with a friend in Brooklyn during my visit, so my 10am tour start time meant that I needed to get an early start to arrive in time. Knowing the subway route already, I figured an hour and 45 minutes would be more than enough time to arrive early. What I didn’t account for was the weekend schedule changes and my natural and unfortunate ability to get on trains without properly reading the train name and destination. Oops. After hopping on and off of 7 different trains, I finally arrived 20 minutes late and met the tour group part way along the route as they already started without me. Luckily, my friend Stevie was attending the tour with me (she managed to make it early coming all the way from Long Island) and she gave me minute-by-minute updates as I was trying to quickly make my way up the streets of Chinatown dodging carts and delivery trucks. I arrived fashionably late in true TwoBadTourists style, and not-so-quietly interrupted the introduction on the history of Little Italy that our guide was giving. Within minutes we were off to our first stop named Alleva, which is the oldest Italian deli and cheese shop in the US. 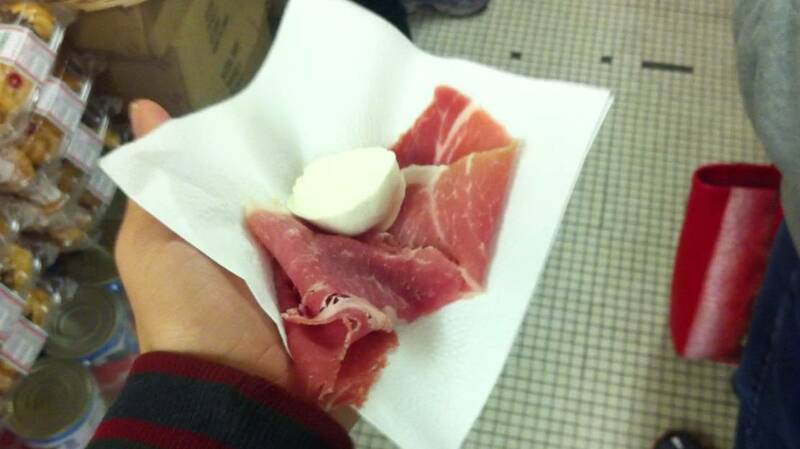 First course – the fattest piece o I’ve even had along with a giant piece of unsalted mozzarella. Though I prefer my cheese salty, this was actually the perfect combo sampled together since the prosciutto is salty on its own. We followed up the tour by passing a sight of a famous mafia shooting from the early 1900’s and made our way to DiPalo’s Fine Foods where we continued to indulge on Italian cheese. And if we hadn’t already eaten enough cheese, we made a pit stop at Grand Appetito for some of the most simple, yet best pieces of pizza I’ve had in a long time. The pizza was thin and topped with a chunky tomato sauce, basil and mozzarella. All ingredients were extremely fresh and the sauce is apparently made from tomatoes imported directly from Italy. Already full from four stops throughout little Italy, we finally made our way into Chinatown. 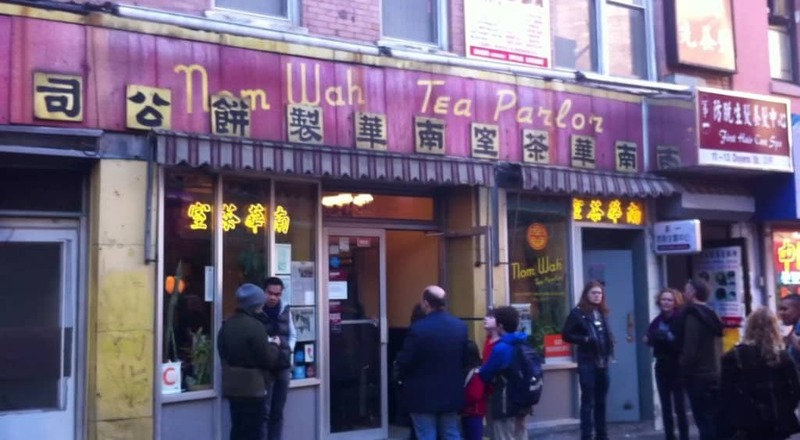 The highlights on this part of the tour were the last two stops at The Tasty Dumpling and Nom Wah Tea Parlor. Not surprisingly, we indulged in pork and chive filled dumplings near the park across from the Tasty Dumpling because the restaurant itself has almost no seating inside. The tour finished off at Nom Wah Tea Parlor where I ate the largest egg roll ever with fresh vegetables, egg and chicken and topped with duck sauce. Little Italy and Chinatown are exciting places in New York City, especially on a guided food tour. I’ve been through these neighborhoods on previous visits, but this time was more intimate and the friendly and knowledgeable guides made the tour a highlight of my trip. While you’re likely to find plenty of good restaurants on your own, the tour guides know the city inside and out and will bring you to the best spots in the neighborhood. Note: The Ahoy Tours NYC sponsored my tour but rest assured all opinions are mine. Have you ever visited Chinatown or Little Italy in NYC? What is your favorite food spot there? Let us know in the comments below! Ya the only problem was the egg roll was the last stop on the tour. So full….! Thank you for sharing your food trip. And to tell you frankly, that is the kind of trip I like to join. :) And just looking at your pics made me want to taste different kinds of food. Those must be yummy. Sigh. Thanks Kelly. I love food tours too :-) You should take one on your next trip or maybe even find one locally if you don’t have any travel plans upcoming! » What’s the Best Traditional Food to Eat during a Visit to Helsinki?